The Ravelry pages showed lots of stellar examples of this blanket. I was particularly taken with this one , which convinced me that this was a project that uses variegated yarn to advantage. I spent hours shopping on line, and narrowed down my choices. Lorna's Laces Shepherd Worsted was on my short list (the same yarn as in the afghan on Ravelry), but I thought it too pricey. Wanting instant gratification, I shopped locally (Mosaic Yarn Studio) and discovered that Dream in Color Classy, while not cheap, had more yardage than Lorna's Laces, so I could get four skeins rather than five to make up the 1,000 yards of worsted that the pattern calls for. See the yarn on the right. The colorway is called Ruby River. 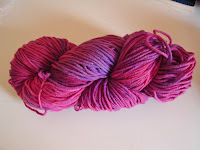 I bought the four skeins, and here is where things started to go horribly wrong. First off, I found the yarn, machine washable merino, to be somewhat stiff in garter stitch. It wasn't scratchy, but at five stitches per inch, the correct gauge, it felt like a hot pad. Next, and worst, my yarn was disappearing at an alarming rate. To spare you the gory details, the upshot is that I frogged this project THREE times until I was at a gauge of four stitches per inch and had achieved an acceptable drape to the fabric. I had knit up the first of the four skeins when a cold hand gripped my heart. By the size of the section I had knit, I would need just less than double the yarn I had purchased: that is 2,000 yards rather than the 1,000 specified in the pattern. WHAT? Even if I could get more of the colorway (doubtful), I didn't want to spend $150 on this project. And what is up with this pattern? Others on Ravelry did not seem to have this problem. But as a knitter, I usually need less yarn than specified, not twice as much. Mystery still unsolved. 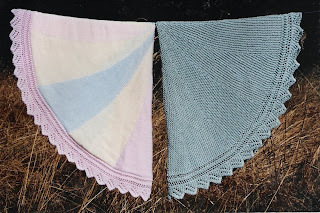 My pinwheel failure was made all the more poignant when I read the blog of my fellow knitter Woolie of Wool Enough and Time. She made the most adorable short-row pinwheel cushion cover out of scraps. Kudos to Woolie, but grrrr. My story is on its way to a happy ending though. I decided to make the yarn over pinwheel instead. After three or four failed attempts to start this project (five stitches on double pointed needles), I am on my way to producing a fine blanket for Rosie. This one is in stockinette, and I must say that the yarn seemed to smile at me as I released it from garter stitch. And I think I'll have a skein left over. Yarn can be so darn contrary sometimes. How odd that someone else had no problems with the same yarn and pattern. Perhaps she altered the pattern in some way and did not mention it. I'm glad you found another pattern you liked. I'm so glad you changed to the YO Pinwheel. I've made it three times and I love it; the second time, I did a lace border http://www.ravelry.com/projects/chronicknitting/round-or-pinwheel-baby-blanket-2 The main body took 5 balls and the border 2 balls. I'm looking for an excuse to make another one. Your colours are lovely. love your colour choice...this is going to be beautiful! These are coming out beautifully! They will make lovely blankets for naptime.